Did people actually wrestle an octopus…as a sport? Yes! The art of wrestling an octopus was a real thing. It wasn’t anything like the type of strongman spectacle, American Ninja Warrior or the Mayweather and Conor fights you see on TV these days. It’s basically men wrestling the sea creature and dragging it to land. Intrigued? Here is everything you need to know about this fact from our colourful history. A team of three divers would descend into the waters at a depth of almost 50 feet and try their best to grab the creature. Whichever team pulled out the heaviest octopus in the shortest amount of time would take home first prize. Credit: Grind Tv This sport was categorised into two divisions – i) with scuba gear (would receive one point per pound of the octopus caught) and ii) without scuba gear (would receive two points per pound). Once caught, judges would weigh the octopus. And when it was all over, the octopus would either be cooked, donated to aquariums or simply released back into the sea. But, how do you wrestle with an eight-armed opponent? The contestants were very skilled people lah. That explains it all. In seriousness, it was simply about skill and practice. 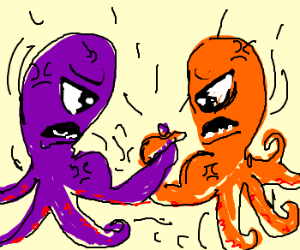 Teams would wrestle the octopus by unwrapping its tentacles and its suction cups before bringing it to the surface. The interest for this game slowly ended as the Washington State Law made it illegal for such sport. What are your thoughts on this? Would you want to watch it live if you had the chance? Share with us in the comments section below. Also, read- The discovery of King Tut’s Tomb. Say Cheers to Organic Alcohol!